Rarely do I feel nostalgia for the past. I am the one who is always planning what to do a week, a month or a year ahead, and who doesn’t look back. That is, until a friend shared a review from the New York Times that inspired me to read Mycophelia: Revelations from the Weird World of Mushrooms by Eugenia Bones. The book has taken me back at least twenty years to the autumns my husband and I and another couple explored woods, meadows and parks here and in other parts of the state in search of wild fungi to cook, photograph, and study. Each outing was an adventure, a search for partially buried treasure, and each came with its own rewards. After reading the mushroom names that spilled off the tongue of author (she writes like she is talking to you), I could call up the images of many from memory. I can still recall the scents of soil, decaying leaves, tree needles, and dank fungi. If we could identify a mushroom as safe we collected it to take home, saute and eat. If we couldn’t we took photographs or brought it home to investigate further. I remember the more notable finds. There was the king boletus that was so big a friend spotted it from the highway. It became part of a pizza. One park close to home surprised us with chanterelles (I’m not naming the park because chanterelle hunters never disclose the exact location of their finds), and another park rewarded us with red amanita muscaria, dangerous to ingest but a great photographic subject. One fall, on a walk through a park on the Long Beach peninsula we stumbled upon thousands of this same amanita blanketing both sides of the trail. It’s easy to make mistakes when you’re identifying mushrooms, with consequences that range from embarrassing to fatal. 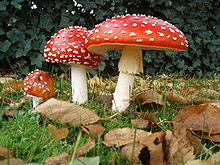 We were on a guided walk at Discovery Park when the naturalist explained that the teenagers lying in the meadow around us combing through the grass believed they were collecting magic mushrooms, commonly known as ‘shrooms,’ but didn’t know enough about these mushrooms to know they were making a mistake. He assured us that they would only suffer disappointment when they consumed them. When I was in graduate school, I shared my office space with a student studying mycology, in particular the genus Psilocybe. I don’t think he survived to graduate, and I’m pretty confident that his collection didn’t survive.